These lettuce wraps are bursting with flavor. The Asian influenced ingredients will dance on your taste buds. These are incredibly addicting and it is impossible to eat just one! Hearty, healthy and just Delectable! Dressing: – Whisk all ingredients together. -In food processor blend Chickpeas, Mushrooms, Walnuts, ½ of the chopped scallions, Water Chestnuts and Salt/Pepper. Pulse for about 30-45 seconds stop at least once to scrap down sides then set mixture aside. -Toast sesame seeds in a dry pan for about 2 minutes or until lightly toasted. Remove sesame seeds from pan and set aside. -Return pan to stove and heat olive oil over medium heat. Add ‘meat’ mixture and half of the dressing, sauté for about 2 minutes until warmed through and incorporated. Remove pan from heat and allow filling to cool. 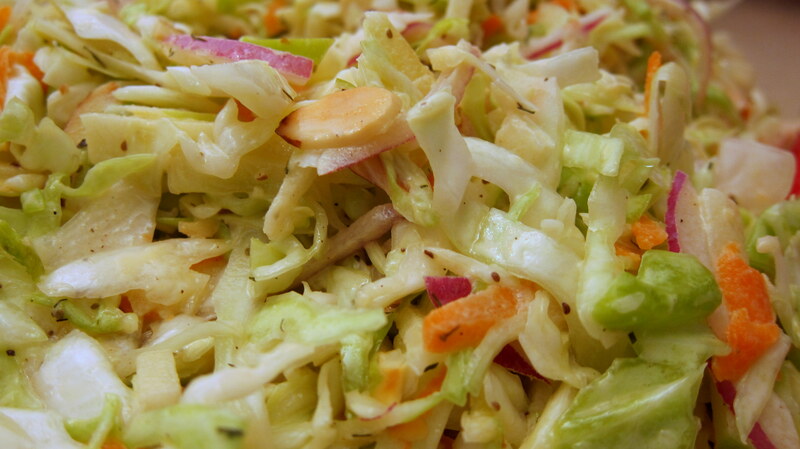 -While mixture is cooling, prepare your lettuce leaves – rinse/pat dry and shred carrots. -For the dressing: whisk all ingredients together. *I only grate the garlic in this recipe since I’m already using my microplane for the ginger, feel free to mince the ginger if you prefer. -Makes 12 wraps. Add about ¼ cup of filling per wrap. Top with about a Tsp of remaining dressing/sauce on each and divvy up the carrots and remaining scallions between each. Enjoy! 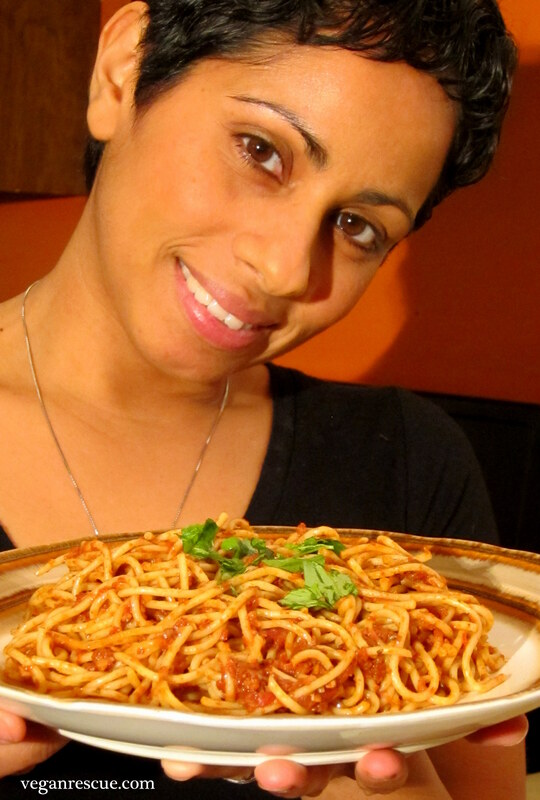 Spaghetti and “Meat” Sauce – Vegan! I was inspired to make spaghetti today (01/19/15); I don’t really need much inspiration since Spaghetti is high up on my list of comfort foods. I was however inspired this day because I cut my hair, chopped it all off! 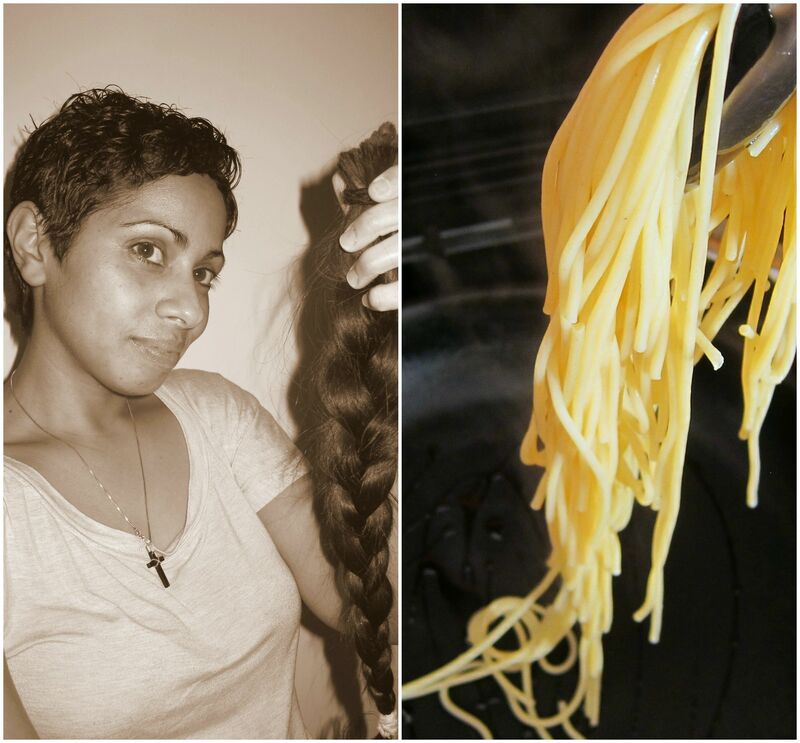 The spaghetti was a warm reminder of my long locks. Speaking of locks…I donated to Locks of Love, this time 21 inches (braided) and 28 inches from 2013 [see pics below]! Now back to my spaghetti recipe. The great thing about this recipe, other than the yummy cruelty-free ingredients, is that it is unbelievably easy to make your own pasta ‘meat’ sauce. The ‘meat’ in this recipe is simply: chickpeas (garbanzo beans), mushrooms and whole walnuts. These three ingredients make a great ‘meat’ base; I’ve used this base in recipes from lettuce wraps to burgers or sloppy ‘joes’ among others. It is so versatile the possibilities are endless. Directions: Process all three ingredients in food processor, pulse for 30-45 seconds. -Heat olive oil in a large pot; add onions and crushed red pepper flakes sauté over medium-low heat for 2 minutes. Add garlic and sauté for another 1-2 mins. Turn off heat. 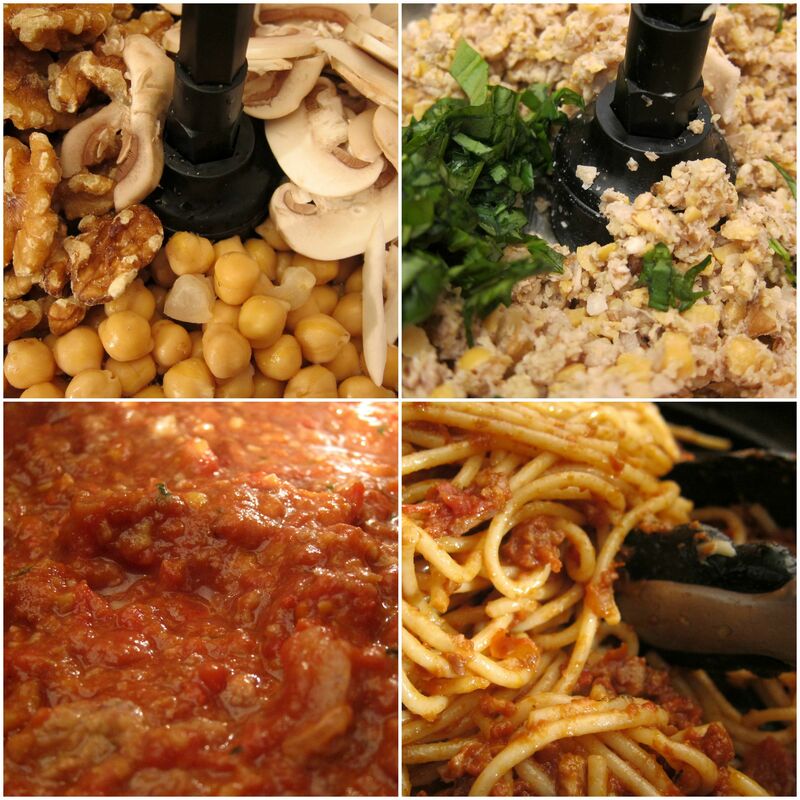 -To Food Processor/Chopper: Add walnuts, chickpeas and mushrooms, pulse for 10-15 seconds. Add in fresh basil and ½ tsp Salt then pulse for another 5 seconds to incorporate. -Add ‘meaty’ mixture to onion mixture. Turn heat back on to medium. Add tomatoes and remaining seasonings (garlic powder, sugar, pepper, salt, italian seasoning), heat to a low slow simmer and continue to simmer for an hour stirring occasionally so the bottom doesn’t stick/burn. – Remember low and slow that is the key. -Prepare pasta according to package until al dente about 9 minutes. Sauce the hot pasta just before serving. My preference is to add a touch of olive oil or earth balance butter to the pasta then ladle in sauce and toss to incorporate. Top with extra fresh basil. Enjoy! -This meat sauce recipe makes enough sauce for (2) boxes of pasta or make spaghetti one day and ‘sloppy joes’ the next. If I use the meat sauce for spaghetti both days, I’ll make a fresh box of spaghetti the next day. -I do suggest organic as much as possible – mushrooms are on the list of always for me. It is suggested to wipe mushrooms clean with a damp cloth instead of submerging in water, why? Because they are like a sponge and will absorb the water and they just won’t cook up the same. This concept (sponge) pertains to their growing environment also – so shoot for organic. -This recipe suggests canned tomatoes but can be easily made with fresh tomatoes. On about 10-12 plum tomatoes cut a shallow ‘X’ on the bottom and top. Place them in a pot of boiling water for 1 minute. Remove from boiling water and place in ice-cold water. Once cooled to the touch remove skin. – Scoop out seeds and reserve liquid – you can add this liquid back in just before serving when you toss the pasta to coat. 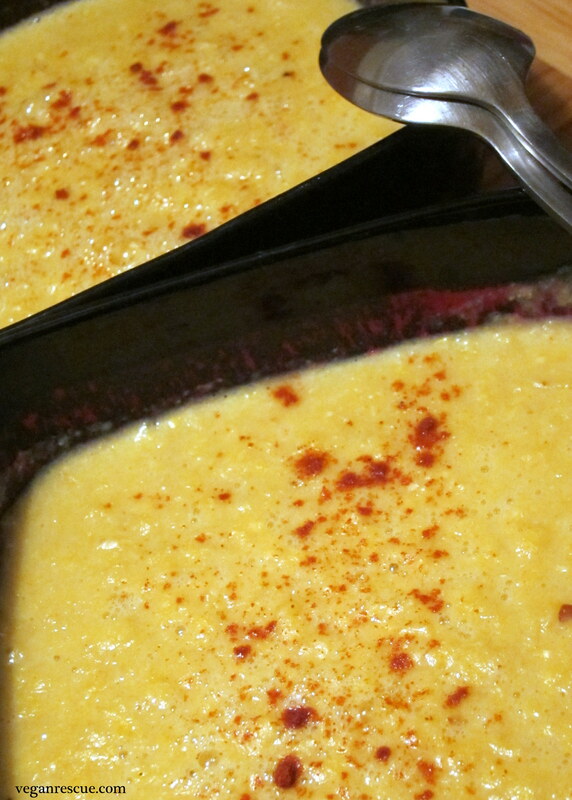 Corn Chowder – I smoked it! My husband and daughter both especially enjoyed this soup. He said, “Best corn chowder ever” and she just devoured it. Towards the end Jasmine tipped that bowl to get the last drop and when she came up for air she asked for more. My son enjoyed it also but it was a little too kicked up for him. You can certainly tone down the spice level to your liking. The smoked paprika and liquid smoke in this soup take it to another level and compliments well with the heat which is tamed by the coconut milk, in my opinion. You can enjoy this soup year-round with frozen organic corn or try fresh local corn when it’s in season (I would use 8-10 ears). -In a large stockpot heat olive oil and sauté onions a few minutes until translucent. -Add garlic cloves and red pepper flakes heat through just for another minute. -Add vegetable broth, liquid smoke, paprika, curry, salt and corn, bring to a boil and them simmer until corn is tender about 8-10 minutes. -Add scallion, nutritional yeast and coconut milk then simmer for 5 minutes. 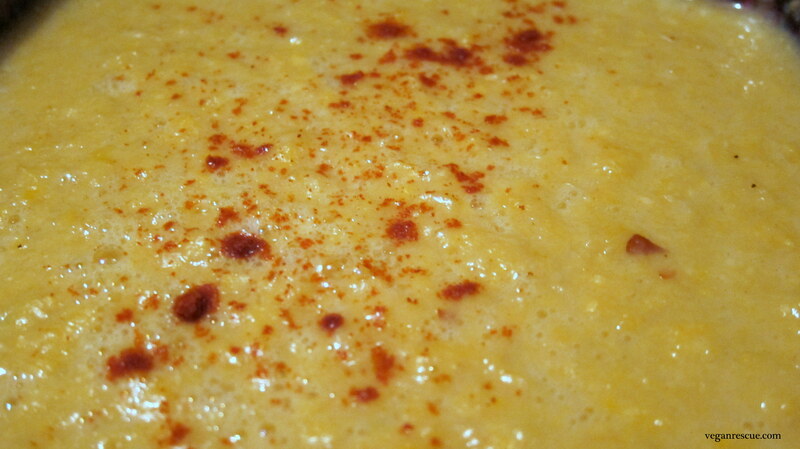 -Pour half the soup into a blender or use stick/immersion blender and puree until smooth yet chunky. -Add a little sprinkle of smoked paprika before serving. Enjoy! When I think of soup I immediately think of my dad. Papi would always make soup in the winter. There was a time that he lived alone and would make large batches of soup, which he’d have for dinner throughout the week and would sometimes take a thermos to work for lunch. I imagine there are thousands of variations of this soup. True to its vegetarian origins this version is truly a hearty Vegan classic. I use organic/non-gmo ingredients in this recipe. This soup will warm your tummy and fill you with a good source of protein and fiber among others nutrients. In a large stockpot (at least 12 quart) heat olive oil and sauté onions let them sweat a few minutes until translucent. Add celery and carrots then sauté about 2-3 minutes. Add 2 Tsp salt, pepper, cayenne pepper, garlic and zucchini and sauté for another minute. 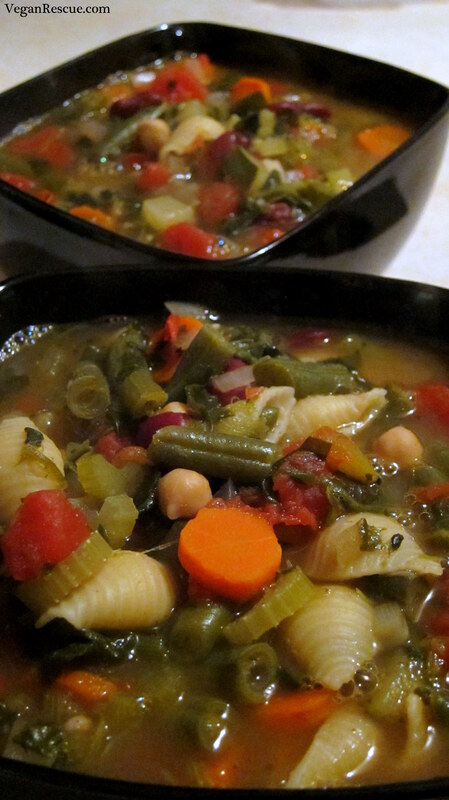 Add vegetable broth, tomatoes, kidney/garbanzo beans and bring to slow boil about 10 mins. Finally, add green beans, spinach, pasta and seasonings (remaining salt, Italian, sage, oregano and basil) continue on a low boil/simmer until pasta is cooked through and green beans are done about 8 minutes. Enjoy! Note: This post utilizes canned beans and frozen spinach/green beans, but I have made this also utilizing dried/soaked/cooked beans and fresh spinach/green beans. Substitute canned beans for 1 ½ – 2 cups of cooked beans. For the spinach and green beans I have just thrown in two big handfuls or fresh baby spinach and a bunch of fresh green beans (trimmed and cut in half) in the last few minutes of cooking. Fennel, Apple and Cabbage oh my! This recipe is fantastic year round. The crisp and crunch makes me think of summer in these cold winter months. Fennel is so aromatic; the wonderful smell instantly hits you upon cutting in, with liquorice notes it tastes how it smells in my opinion. Fennel is related to celery, dill and carrots (aromatic plants) so why not add them all to the recipe. The dill and celery seeds in this recipe add to the flavorful taste. Vitamin C, Fiber & Potassium, great for immunity! 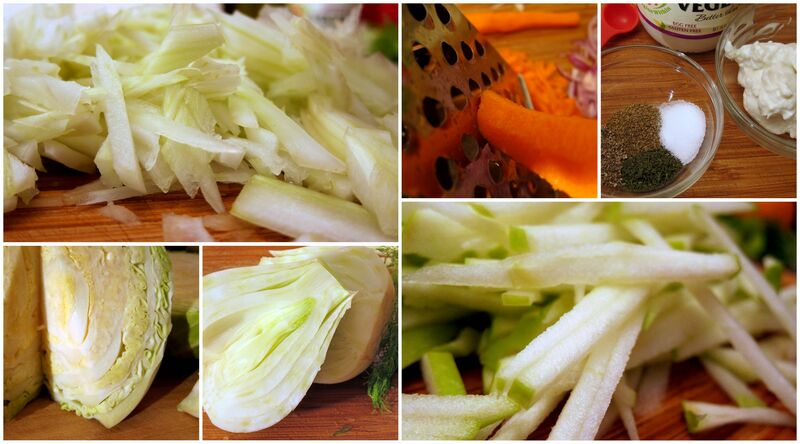 As noted above, core the Fennel Bulb and Cabbage then slice/shred finely – See Note*. 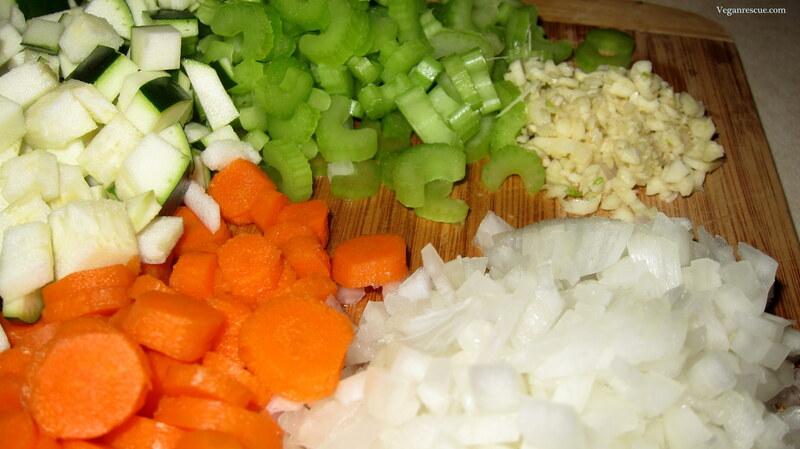 To a large bowl, add sliced red onions and shredded carrots – I use a box grater for the carrots. Julienne the Granny Smith Apple and add to the bowl; I use organic apples and keep the skin on. -In a small bowl whisk the: Vegenaise, Olive Oil, Orange juice (fresh squeezed), seasonings and Agave. -Drain the sliced fennel and cabbage (I use my salad spinner). Add to large bowl with Carrots, Onion and Apple. Add dressing and toasted almonds then toss together to coat. Refrigerate for about 30 mins. before serving. Toss again before serving up. *Note/Tip: After I slice the Fennel bulb and Cabbage I let them hang out in my salad spinner with ice-cold water. Leaving them in the ice cold water while you prepare your other ingredients will keep them crisp and crunchy. There comes a time or two or too many in our busy lives that we need a jolt, boost or uppercut of energy. This week has been one of those times for me. Between work schedules, our two dogs and the kids back to school from winter break we can all use a little pick me up. Whether I pop an energy ball in for quick morning boost or just before a workout these are certainly sure to deliver. This week I have redirected my focus towards more on raw and fresh ingredients. Despite being vegan we too felt the heaviness of all the holiday fare, not to mention, the exhaustion of all the hustle and bustle. 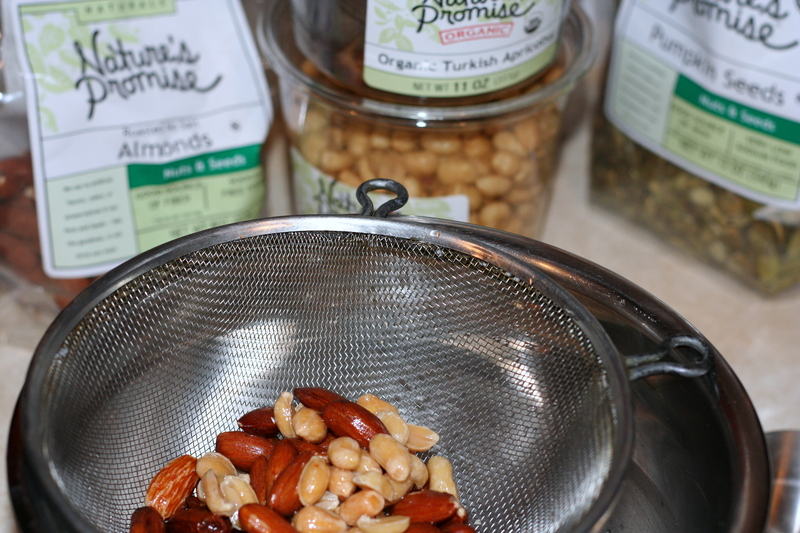 In this recipe I soak the almonds, pumpkin seeds and (1/4 Cup) Peanuts for about 8 hours (see below for a suggestion and note). Soak in fresh water (filtered if available) with 1 Teaspoon of Salt (I use sea salt). After the seeds/nuts have soaked, drain and rinse in fresh water. -In Food Processor – place Soaked nuts/seeds; Coconut Oil; Chia Seeds; Hemp Seeds, Maca and Cocoa powder and pulse for about 30 seconds. 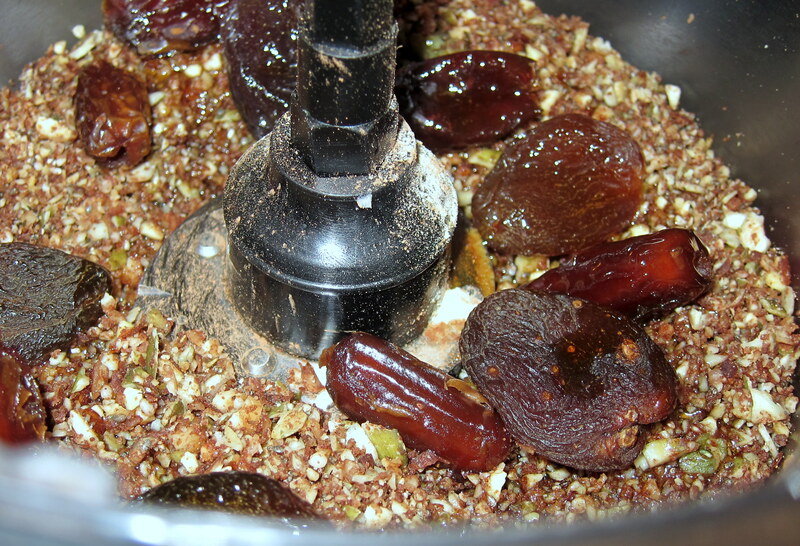 Add Medjool Dates with Turkish Apricots and pulse for another 30 seconds. Finally, add remaining ¼ Cup of Peanuts and Maple Syrup. Pulse until incorporated this will form a ball or a paste-like mixture. (I only add the ¼ cup unsoaked/dry peanuts in the final step, because it adds a familiar peanut taste/texture that we’re used to. However, you may soak all the peanuts (1/2 Cup) in the initial step for nutritional purposes). 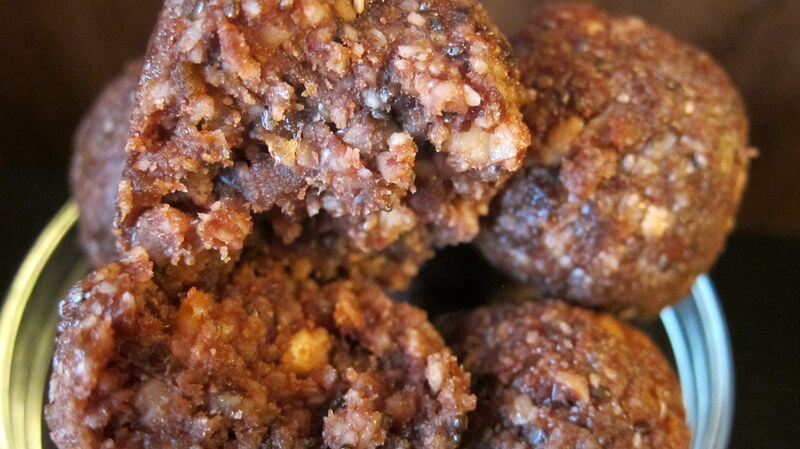 -With wet hands grab about 1½ tablespoons, or so, of mixture and roll into 1 inch balls. You may want to wet hands again halfway through. 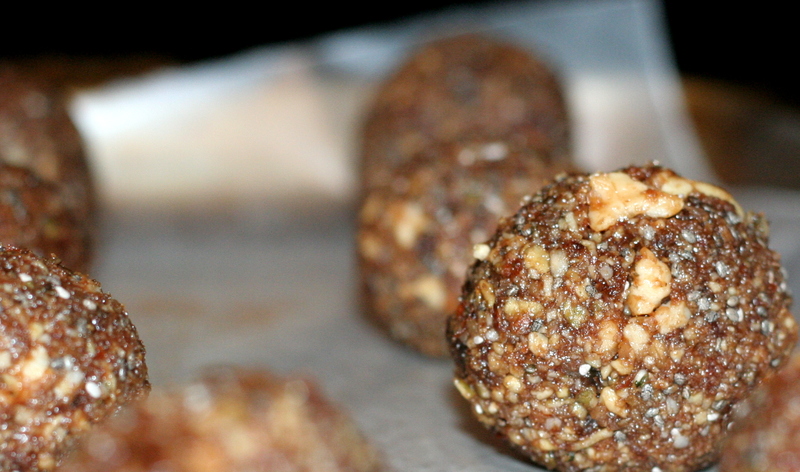 -Place Raw Energy Balls on cookie sheet lined with parchment/wax paper. Refrigerate for at least 30 minutes before serving. This recipe should produce about a bakers dozen, so if you can’t wait like me, pop one in and call it a dozen! Each ball is about 140 calories. Store in a sealed container – I like to keep them nestled in the parchment paper. They should remain fresh for 7 days; they typically don’t last that long at home. Suggestion: If I’m preparing this on the weekend, I’ll put the seeds/nuts to soak the night before and prepare the recipe the next morning. If it’s the weekday, I’ll place them to soak in the morning before I leave for work, so I can prepare the recipe after work. If your initial reaction to soaking is as mine was, that it sounds very time consuming, especially for a quick 10-minute recipe…it’s not so bad. When I plan ahead and use the above system it works for me. There have been a few situations where I forgot to soak or was in the mood (needed) this recipe at an inopportune time; I can say that I’ve made this recipe after soaking for 2 hours and once after soaking for 30mins. to at least softened them. Note: Soaking seeds/nuts improves the nutritional value – the vitamins, proteins and allows for better digestions. It also removes anti-nutrients/toxins. Place nuts/seeds in warm fresh/filtered water a 2:1 ratio seems to work fine. I typically add a teaspoon of salt.